Are you suffering Sciatica in Calgary? Then National Spine Care has the solution for your Calgary Sciatica pain. 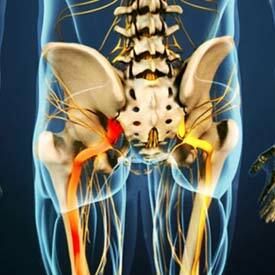 Sciatica (or sciatic neuritis) is a set of symptoms including pain that may be caused by general compression and/or irritation of one of five nerve roots that give rise to the sciatic nerve. It may be caused by compression or irritation of the sciatic nerve itself. The pain is felt in the lower back, buttock, and/or various parts of the leg and foot. In addition to pain, which is sometimes severe, there may be numbness, muscular weakness, pins and needles or tingling and difficulty in moving or controlling the leg. Typically, the symptoms are only felt on one side of the body. The most common cause of sciatica is a disc bulge or disc herniation in the lower lumbar spine (low back area). Far less common, compression and irritation of the sciatic nerve can occur as it exits the pelvis, passing either under or through the piriformis muscle. The piriformis is a small muscle in the buttock and hip area. A good way to think about a disc in the lumbar spine is that they are built like a jelly doughnut. In a healthy disc, the jelly is contained inside the doughnut. Once injured, the outside of the doughnut becomes weaker, allowing the jelly to either bulge backwards or even herniate (squirt) out. If the jelly bulges or herniates back into where the nerves are travelling, compression or irritation occurs, sending pain, numbness, pins & needles or weakness where ever that nerve travels. With the nerves that make up the sciatic nerve, this will be down the leg and sometimes into the foot and toes. It is still a mystery why the piriformis muscle sometimes starts to irritate the sciatic nerve. Many doctors think that the condition begins when the piriformis muscle goes into spasm and tightens against the sciatic nerve, squeezing the nerve against the bone of the pelvis. In some cases, the muscle may be injured due to a fall onto the buttock. Bleeding in and around the piriformis muscle forms a hematoma. A hematoma describes the blood that has pooled in that area. The piriformis muscle begins to swell and put pressure on the sciatic nerve. Soon the hematoma dissolves, but the muscle goes into spasm. The sciatic nerve stays irritated and continues to be a problem. Eventually the muscle heals, but some of the muscle fibers inside the piriformis muscle are replaced by scar tissue. Scar tissue is not nearly as flexible and elastic as normal muscle tissue. The piriformis muscle can tighten up and put constant pressure against the sciatic nerve. The good news is that our bodies are designed to heal naturally. Certain things can be done to create an environment that will promote healing. Our team of chiropractors, physiotherapists, acupuncturists and massage therapists work together to restore normal function, movement and muscle balance to the low back, buttocks and legs. Normal function provides the environment your body needs to heal that disc injury properly. If pain is restricting your ability to sleep, move and function, our physicians can offer effective, temporary pain medication. Our physicians work directly with the rest of the team to ensure any prescribed drugs you may need are used judiciously and safely. One of our team members, Dr. McMorland, was the principle investigator on a research project that compared chiropractic therapy to back surgery for patients experiencing sciatica due to a herniated disc. The results showed that in chronic cases (people that had their pain and symptoms longer than one year), chiropractic care was just as effective as surgery in 60% of the cases. If you have had your symptoms for shorter periods of time, the chance of success with this treatment goes up significantly. Click here if you want to read more about this . Our health care team uses science to guide clinical decision making to ensure you get the best treatment possible. In additional to traditional chiropractic and physiotherapy treatment, we use specialized intermittent traction and mobilization treatment tables to gently and safely reduce pain and restore normal movement to your low back and hips. As your symptoms ease, our physiotherapists and chiropractors will gradually advance your program to include posture training, muscle strengthening, and general conditioning. Although recovery and rehabilitation time is different for each patient, as a guideline, we expect to see significant improvement within six to eight weeks. More chronic cases may take longer, with significant improvement expected within eight to twelve weeks. It is estimated that over 95% of disc-related sciatica can be cured with effective conservative treatments like this. Sometimes, however, the problem may require advance intervention such as cortisone injections or even back surgery. Our health care team has the expertise and knowledge to assist you with those decisions. We remain in close contact with our interventional radiology colleagues to assist in pain-controlling spinal injections such as cortisone. We also maintain a close relationship with our spinal neurosurgical colleagues at the University of Calgary Spine Program should you need to obtain a surgical consultation. Since the sciatic nerve is a bundle of nerves running down from the low back, down the buttocks and behind the knee to the foot, Sciatica pain can arise from many different causes. The needles of Acupuncture both reduce the pain and increase circulation in the area of the nerve inflammation, and promote healing of the nerve. In Traditional Chinese medicine (TCM), a physical condition like this refers to as a blockage of Qi (energy) and blood in specific meridians. The Acupuncture “opens the channels,” the meridians, and create free flow of Qi and blood, that relieve the inflammation and reduce the pain. Acupuncture is safe, works fast, and can treat the weakness that brought about the injury in the first place. At National Spine Care, we use a combination of Acupuncture and traditional Sciatic Nerve Pain treatments. book your Calgary Sciatica consultation appointment today!